You will find our estate in Neuleiningen, on a spur of the Haardtmountains in Palatinate, Germany. Here our vines feel just as well as we do. 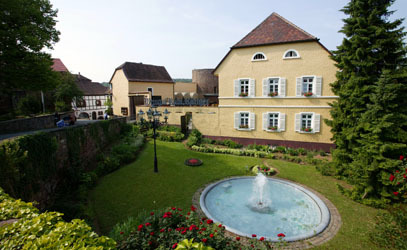 Neuleiningen is a picturesque castle- and winevillage with old half-timbered houses and medieval streets, where people like to celebrate and enjoy life. Here we produce typical, unmistakable wines - we have to make use of the excellent conditions offered by nature in our sites. Our family has been dedicated to winemaking since 1643. Rudolph Rüttger is the main responsible for the wines. Before joining the family business, he gained experience at home and abroad. 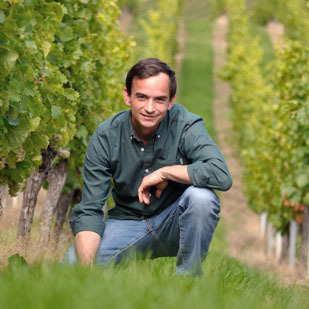 After completing his studies at the HBLA Klosterneuburg, he developed some fresh ideas, influenced by jobs at wineries in Austria, New Zealand, and Germany. He now takes care of the works in cellar and vineyards with the help of his father (Heinrich Rüttger), also his Mother Theresa is often helping out. This is a family business: His siblings Heinrich and Katharina (on the left in the picture), especially love to help out when there are Winefest-times and often act as "external consultants". Our wines, our house, our soils, and our customers are dear to us - we are winemakers of passion.